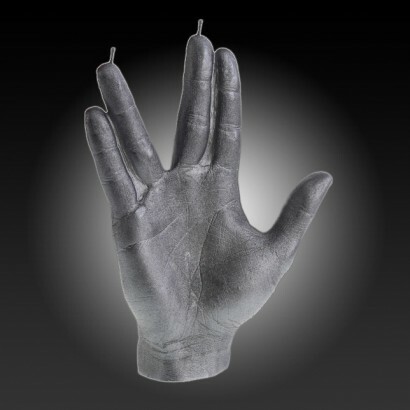 Star Trek fans will love this very realistic hand candle giving the Vulcan salute that's usually accompanied with the greeting "live long and prosper". 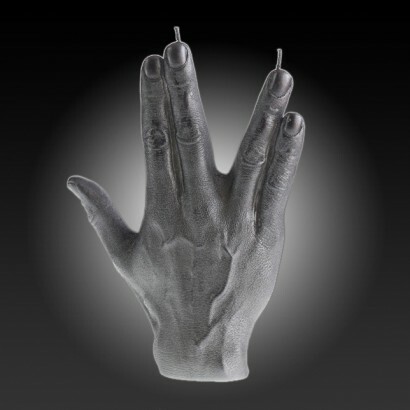 An iconic symbol that's known and loved amongst "trekkies" and movie fans all over the world, "the double fingered version of Churchill's victory sign" is moulded in wax with steel colour to give a modern twist. With a thirty hour burn time this substantial double wicked candle is a logical choice for decorating your home and makes a unique table decoration!